Tarantulas are quiet and need little space, so keeping them as pets can be a fascinating hobby. However, if you want to handle your pet a lot they aren't the best choice. There are over 800 species of tarantulas belonging to the family Theraphosidae. They are native to many areas and climates, incluiding places that are arid, subtropical, and tropical. They are roughly divided into two groups: "old world" (from the eastern hemisphere) and "new world" (from the western hemisphere). One of the more popular species kept as a pet is the Chilean rose (Grammostola rosea), a hardy, easy to care for spider native to Chile. In general, the best "beginner" tarantulas are the ground dwellers or burrowers as they tend to be a little slower moving. The ​pinktoe (Avicularia avicularia) is often cited as a good first arboreal tarantula but not a good first tarantula overall. In general, arboreal species are more challenging to care for, and the pinktoe is quite fast and agile, making handling more difficult. As a pet, a female is usually the better choice simply because females tend to be much longer lived than males. A female Chilean rose may be expected to live over 20 years whereas the male of any species will not likely survive more than a couple of years at best. A large enclosure isn't necessary but if you have an arboreal species of tarantula you will need a tall cage, and a burrowing type will need appropriate substrate or hiding places. Generally, spiders should be housed one to a cage as they are not social. For burrowing or terrestrial spiders, a general rule of thumb is that the cage should be approximately three times the leg span long and double the leg span wide. The height should not be much more than the length of the spider, as these spiders are heavy and if they climb and fall it can be dangerous, or even fatal. A 5-gallon aquarium will work well. A larger tank is not better in this case, as tarantulas do not need a lot of extra space and a large tank may make prey harder to find. Arboreal tarantulas need a cage that is tall to provide climbing room with branches, twigs, or some other structure on which the spider can construct its web. A 10-gallon aquarium set on one end can work well for this purpose. They do need to have a very secure lid, as they can be escape artists, but the lid must also allow adequate ventilation. On the bottom, a substrate of vermiculite, or vermiculite mixed with varying ratios of potting soil and/or peat, should be provided at least 2 to 4 inches deep to provide burrowing room and to hold moisture. Wood chips, especially cedar, should be avoided. Your tarantula also needs a place to hide. A piece of cork bark, a half hollow log (as available from pet stores), or half a clay flower pot on its side are all good options. Tarantulas do not need bright lights but rather should be kept in a darker area of a room where direct sunlight will not fall on the cage. Incandescent lights should not be used for heating as they could potentially dry out the tarantula. Heating strips or pads (available at pet stores for reptiles) can be placed under a small part of the cage for heating needs. Most species of tarantula do fine somewhere between 75 to 85 degrees Fahrenheit. For tarantulas that do not require high humidity levels, a water dish (shallow) in the cage and misting once a week should be sufficient. For those that require higher humidity, more frequent misting will be necessary. In any case, temperature and humidity gauges should be used to monitor conditions. At the higher temperatures, extra care must be taken to ensure adequate humidity levels. At the same time, excess humidity can encourage mold growth and should be avoided. The cage should not need cleaning frequently. For spiders kept at a relatively low humidity level, once per year is likely enough (earlier if mold, fungus or mites are noticed). For those kept in a more humid environment, this will need to be done more often. A diet of crickets, supplemented with other insects, is fine for pet tarantulas and adults only need to eat about once a week. Some owners may try to mimic how a spider would eat in the wild and offer meals at random (maybe a couple of crickets then one cricket several days later, then a few crickets a week after that, and so on). Adults may also fast for extended periods (a month or two is not unusual), particularly before a molt. Growing spiders, however, should be fed several times a week. The crickets should be gut loaded prior to feeding your tarantula; keep them on a diet of nutritious food and dusted with vitamins prior to feeding. Remember that what goes into the cricket is what you are ultimately feeding your spider. Mealworms, super worms, and roaches can be fed on occasion. Larger tarantulas can even be given pinkie mice and small lizards if desired, although it is probably not necessary. The most important thing is to keep the food smaller than the tarantula (that is, smaller than its body) and make sure the tarantula isn't harmed by its prey. This includes not feeding any wild caught insects unless absolutely certain there is no risk of pesticide exposure. A shallow water dish can be provided. It needs to be very shallow to prevent drowning and if there is any doubt some pebbles can be placed in the dish to give the spider something to climb out on if necessary. The biggest threat to pet tarantulas is the chance of being dropped or falling from a great height. These animals may look fierce, but a fall could cause serious injury such as a ruptured abdomen. Dehydration is another common problem for tarantulas; if their enclosure is not humid enough, they may become lethargic or otherwise unwell. Molting is how the spider grows to a larger size, by shedding the old exoskeleton and producing a new one. This is a stressful time for a spider and also when humidity levels are most critical. The spider stops eating and then will lay on its back to molt. The molting process may take several hours. Once the old exoskeleton is shed it will take several days for the new one to harden (this is when growth occurs) and the spider should not be fed during this time as it is vulnerable to injury. In addition, the spider should never be handled during the molting and hardening time. It may take up to two weeks for the spider to fully recover after molting. Many pet stores will sell tarantulas, but if you can, try to get one from a reputable breeder. You'll have a better idea of the animal's health history and you can be sure you're not getting a spider that's pregnant or otherwise infirm. Never try to take in a wild tarantula as a pet. There's just no way to be sure of the animal's health or temperament. When choosing a spider, avoid spiders that are hunched with their legs curled under them, or that are housed without a dish of water. Try to find out the scientific name for the spider (as that will be the best way to get the appropriate care information) and make sure the age and gender are known. Tarantulas can bite and their bites are venomous. However, for most species, the toxicity of their venom is much like that of a bee or wasp. It is most likely to cause a nasty local reaction including pain, redness, and swelling. However, people can have an allergic or anaphylactic reaction to spider bites in the same way that some people react to bee stings, and this reaction can be fatal. 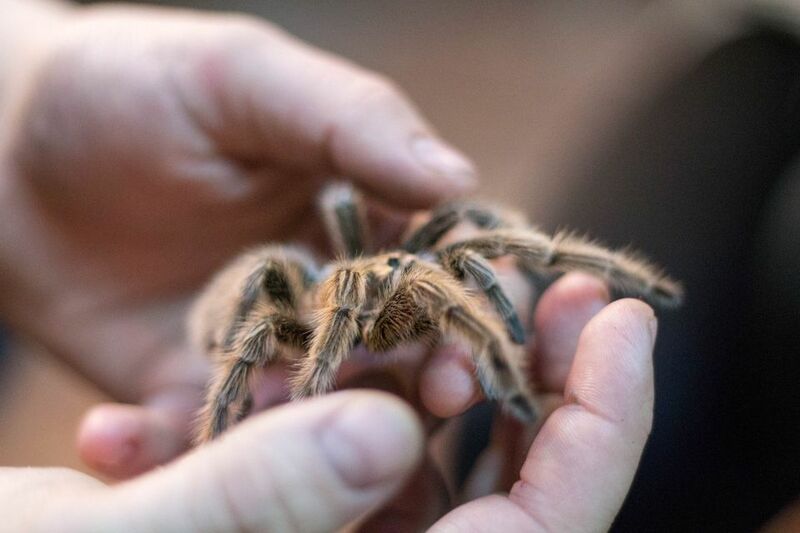 Also, there are few species which have a stronger venom that could potentially be fatal or at least make the bite victim quite ill.
Another concern with regards to handling tarantulas is irritation and itching from special hairs found on some new world tarantulas. These tarantulas possess what are called "urticating" (itch-causing) hairs on their abdomens, which they can release by vigorously rubbing their abdomens if threatened. These tiny hairs are barbed and can work their way into the skin and cause itching and irritation. If these hairs get into the eye they can easily penetrate the eye and cause inflammation. Be very careful not to rub your eyes after doing anything with the spider and its cage until washing your hands and don't get in too close to look at your spider. If you get some hairs on your hand you can try blotting them with tape and then washing well. Topical cortisone cream might also help with the itching. Otherwise, check out other spiders and insects that make good pets.